Welcome to Surshringar.com, a site dedicated to Dhrupad and the Society for Historic and Rare Instruments of India (SHRII). The surshringar is a beautiful, historic and rare instrument (see the photo above) that originated in the late 18th century. It is estimated that there are less than 30 surshringars in the world. 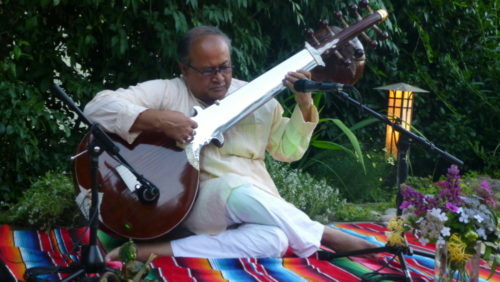 The primary type of music that is played on a surshringar is Dhrupad. As a result, the surshringar is a fine example of the crossroads between Dhrupad and the Society for Historic and Rare Instruments of India. The purpose of the information on this site is to provide basic information to help those interested in Dhrupad or Historic and Rare Instruments of India. It is not intended to be “the” source of information for many of the topics presented. If readers question the information or wish to find out more, they should head to the sources provided in each of the references sections of the site. And, if you find an error or omission, please contact us. We’d like to provide the most accurate information possible. 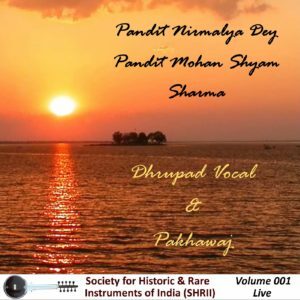 SHRII’s first “Live” release featuring Pandits Nirmalya Dey and Mohan Shyam Sharma is now available at www.cdbaby.com. In honor of Mahashivaratri, please join SHRII and special guest Somjit Dasgupta for a a deep dive into ragas and instruments that relate to Lord Shiva. SHRII is pleased to present a surshringar concert featuring Kolkata multi-instrumentalist Somjit Dasgupta.